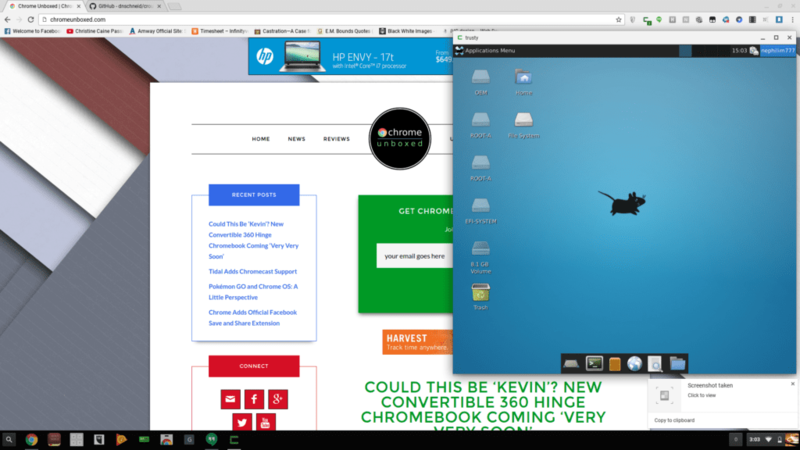 Dual booting Ubuntu Linux on your Chromebook can add a new level of productivity to your device. Whether you are wanting to install applications not accessible in Chrome OS or running your favorite Steam games, Ubuntu on a Chrome device is definitely a must-have around our office. For a step-by-step of installing Ubuntu Linux on your Chromebook, check out Robby’s video here. Now that you’ve installed Ubuntu on your Chromebook, Xiwi crouton integration extension will allow you to run your Linux environment in a browser on Chrome OS without having to switch back and forth between environments. If you followed the installation instructions in the article above, you can now enable Ubuntu in a Chrome window by hitting CTRL + ALT + T and opening crosh (Chromioum OS Developer Shell). XFCE is the desktop environment we used for the video. If you chose a different desktop (Unity, Gnome, etc.) you need only substitute the correct desktop environment. Give the prompt a few seconds and Ubuntu will open and run in a Chrome OS window. Please note that you will likely have to hit your full-screen button (F4) to get out of full screen when it launches.